This wa s my second visit to the city of love or the city of flowers, Dalat, in the Central Highlands of Lam Dong after a vacation with my mom twenty years ago. Dalat brought me, a young lady, a combination of peaceful, romantic and elegant images which was in stark contrast to the unpleasant feeling of a 10-year-old girl who was irascible because of coldness and carsick beforehand. I find this is a perfect time of the year to feel the spirit of the city and to admire its beauty. Dalat has just wrapped up its 120th anniversary and a huge celebration of the fifth flower festival. Tourists to the city at this time can admire colorful flowers blooming everywhere from welcoming banners to pedestrian paths and around the Ho Xuan Huong Lake. People can also find the image of girls and couples in their colorful and cozy winter outfits as they pose for photos as the weather turns cold at around 14 Celsius degrees. Travelers who have more time can rent a bike to cycle around and admire the dreamy city under a slight layer of mist which makes it look more romantic as you take in the immense pine forest in early morning. Then, you can pass some of the most beautiful architectural buildings in the city, including the College of Pedagogy and the company which specializes in all things maps on Yersin Street, the train station and Dalat University. People can treat themselves to two local specialties, namely hot soya milk accompanied with delicious banh trang nuong grilled paper cake served with eggs, onion and dried shrimps, which you can easily find on Yersin Street and around Ho Xuan Huong Lake. 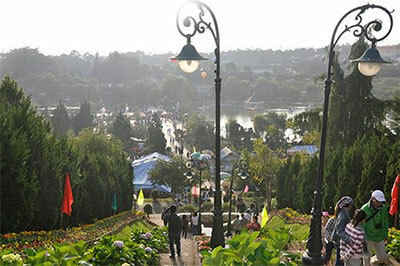 A coffee by the lake is also a must for visitors to Dalat as they can experience the city’s typical cold weather, the beauty of the lake and enjoy a special time and place to chill out. Wandering around the area from Hoa Binh Street to Dalat Market is also a good choice to discover the city’s specialties and locals’ activities at night. From a distance, tourists can recognize the market with the delicious smell of food vaporizing in the air. Some rustic but delicious cuisine available is boiled corn, grilled sweet potatoes, grilled squid/chicken/beef/sausage on a coal fire for authentic taste, porridge and pho (Vietnamese noodle). People can also browse for their favorite souvenirs at street-side shops.